King Pin Lock #1111 is portable and easy to install. 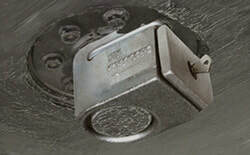 This solid cast steel alloy king pin lock covers and locks the king pin to prevent unauthorized hook ups. A steel slide uses an ABLOY® high security lock cylinder with internal tumblers like a safe. Only one of 360 million keyed combinations will open it. Includes carrying handle. 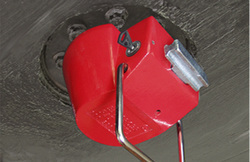 The unique conical cast aluminum alloy designed king pin lock captures grease for a clean quick installation. 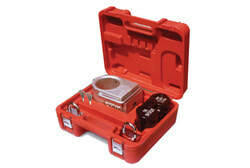 The internal capture slide uses an ABLOY® high security locking cylinder with internal tumblers like a safe. Only one of 360 million keyed combinations will open it. Includes carrying handle.